Smart Medical Academic and Research Training ( ((SMART), Sunshine hospitals, Secunderabad, Telangana, INDIA. The study was aimed to assess the anti-oxidative and anti-diabetic efficacy of few dietary supplements such as Artocarpus heterophyllus (Raw Jackfruit), Zea mays (Corn Silk), Syzygium cumini (Black plum), and Shilajit (Black asphaltum) in in vitro and in vivo models. The phytoextracts were compared with the known commercial diabetic drugs (Aminoguanidine, Glibenclamide and Insulin) in controlling Streptozotocin induced hyperglycemia, advanced glycation end-products (AGEs), hyperlipidemia and activation of inflammatory mediators (iNOS) in in vivo. Collection and preparation of phytoextracts, superoxide anion scavenging assay, phosphomolybdate assay (total anti-oxidant capacity), Hydroxyl radical scavenging assay, quantification of hemoglobin glycation, body weights, lipid profile, Pro-inflammatory gene expression, agarose gel electrophoresis and histopathology. 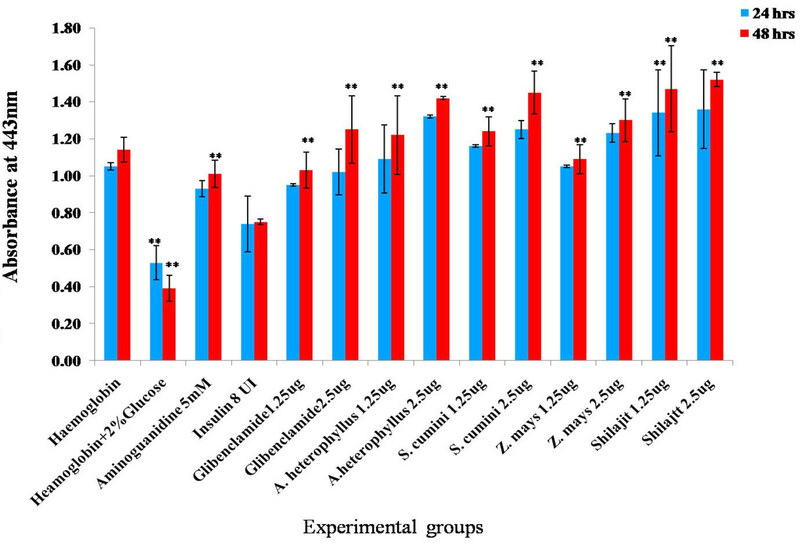 We found that natural extracts of A. heterophyllus, S. cumini, Z. mays, and Shilajit exhibited considerable antioxidant capacity and inhibited hemoglobin glycosylation in a dose-dependent manner in in vitro. In STZ-treated diabetic rats, the extracts showed clear effects on blood glucose and lipid levels, body weight and pro-inflammatory gene expression (iNOS). 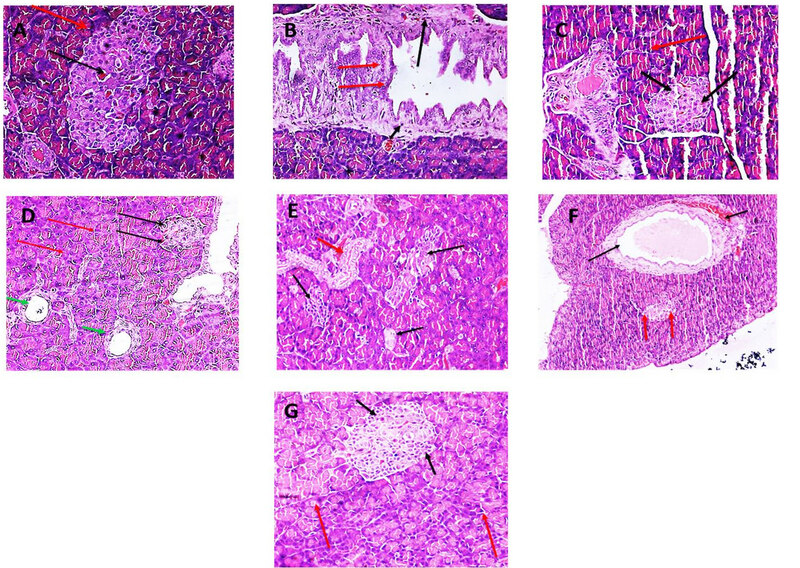 Histopathology of treated rat pancreas further supported our in vivo findings. Overall, our study indicates that the natural extracts we tested could be a useful source of antioxidant agents, functional foods and nutraceuticals, particularly in diabetes and related complications. The findings from our study showed reversal of the effects induced by Streptozotocin administration on phytoextracts supplementation in experimental diabetic rats and the therapeutic capacity was similar to that of commercial diabetic drugs, hence these extracts could serve as an alternate in management of diabetes and allied complications. The present study relates to the effects of A. heterophyllus, S. cumini, Z. mays, and Shilajit extracts on glycation of hemoglobin (in vitro studies). The parameters such as body weights, biochemical (hyperglycemia and hyperlipidemia), molecular expression of pro-inflammatory gene (inducible nitric oxide (iNOS)) and morphological changes in the pancreas were studied in Streptozotocin induced diabetes in male Wistar rats. The extracts reversed the above mentioned parameters in experimental diabetic rats and correlate with the therapeutic capacity of the standard drugs (Glibenclamide, Insulin, Metformin and aminoguanidine). In the present study, we have made an attempt to validate the anti-hyperglycemic efficiency of the natural extracts of Artocarpus heterophyllus (Raw Jackfruit),17 Corn Silk (Zea mays),18 S. cumin (Black plum).19,20 and Shilajit (Black asphaltum).21 in vitro and in vivo models. 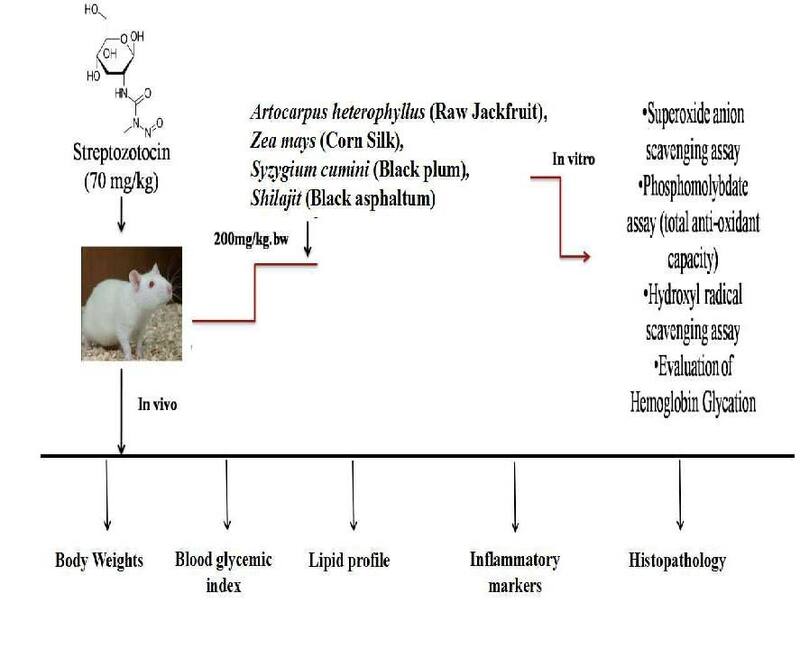 A.heterophyllus contains high fibre content (~11 per cent), and also possess anti-diabetic and anti-oxidative properties.17 Zea mays silk or Corn silk (Z.mays silk ) extracts are known to exert anti-hyperglycemic properties. The S. cumini (black 1plum) bark, leaf and seed extracts were used in Ayurveda and Unani systems of medicine for treating diabetes, inflammation, dental issues, digestive disorders and dermatitis.19 Shilajit is a complex mixture of organic humic substances (Lava rocks) found in Himalayas and Hindukush ranges of the Indian subcontinent which possess medicinal properties.21 Processed Shilajit provides protection against STZ induced oxidative damage and diabetes in rats. We investigated the anti-oxidant and anti-glycation efficiency of natural extract in in vitro and in vivo. Type 1 diabetic rat model was developed by Streptozotocin (STZ) administration and its toxic effects were ameliorated with the administration of natural extracts. Our biochemical, molecular and histopathological results provide a rational basis to consider the therapeutic and supplementary role of the natural product extracts in management of diabetes and its allied complications. 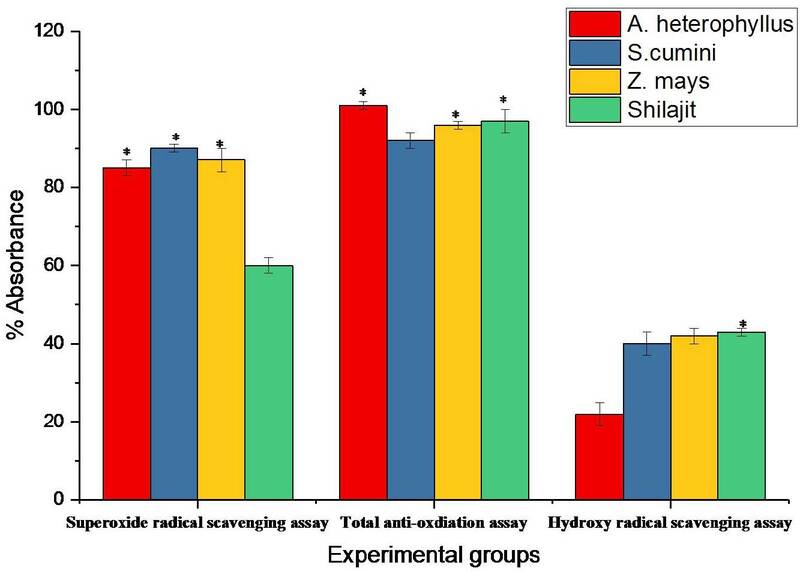 Comparison of free radical scavenging efficiency of various plant extracts. Hemoglobin glycation was estimated by the method of Adisa et al. (2004).25 The concentrations of glycated hemoglobin were estimated using colorimeter at 443nm after an incubation period of 24 and 48 h.
Wistar male rats aged 6 months, weighing between 180-200 g and the standard pellet feed were procured from Jiva Lifesciences, Uppal, Telangana, India. The animals were maintained as per the guidelines CPZ.mays silk EA (CPZ.mays silk EA/IAEC/JLS/003/03/15/002), India. Type1 diabetes was induced through single intraperitoneal injection of freshly prepared Streptozotocin (STZ) (70 mg/ kg b.w.) in 0.1 M citrate buffer (pH = 4.5) to overnight starved rats.26 Diabetic rats were permitted to drink 20% glucose solution overnight to overcome the initial drug induced hypoglycemic death. The blood glucose level was measured after three days, and rats with glucose levels >250 mg/dL were considered as diabetic. At the time of induction, control rats were injected with 0.2 mL of vehicle (0.1 M citrate buffer, pH 4.5) alone. 42 males were divided into 7 groups (6 normal and 36 STZ diabetic existing rats) were used. They were separated into seven groups of 6 rats each. Group I: Control rats (were given 0.5 mL of 0.9% saline orally for 35 days). Group II: Diabetic group (STZ 70 mg/kg b.w.). Group III: Diabetic rats were given Glibenclamide (600 μg /kg b.w. dissolved in 0.5 mL of 0.9% saline) for 35 days. Group IV: Diabetic rats were given A. heterophyllus (200 mg/kg b.w. dissolved in 0.5 mL of 0.9% saline) orally for 35 days. Group V: Diabetic rats were given S. cumini (200 mg/kg b.w. dissolved in 0.5 mL of CMC) for 35 days. Group VI: Diabetic rats were given Corn silk (Z.mays silk) (200 mg/kg b.w. dissolved in 0.5 mL of 0.9% saline) for 35 days. Group VII: Diabetic rats were given Shilajit (200 mg/kg b.w. dissolved in 0.5 mL of 0.9% saline) for 35 days. Towards the end of the study (35 days), the animals were euthanized by ketamine (24 mg/kg/body). To investigate the effects of anti-diabetic drugs, blood was collected from the diabetic rats every alternate day for 5 weeks and they were uniformly grouped for glycosylated hemoglobin and lipid levels among groups and for each model. During the study period of 35 days, body weights of experimental groups were determined on the 1st day and 35th day after induction of diabetes by administering STZ. The mRNA expression levels of iNOS carried out using semi-quantitative reverse transcriptase-polymerase chain reaction (RT-PCR).12 Briefly Total cellular RNA was isolated from tissue using RNA sure mini kit according to manufacturer’s protocol. cDNA was synthesized from 2 μg of total isolated RNA by incubation for 1h at 42°C with M-MLV reverse transcriptase (Thermo Scientific) and oligo (dT) 18 primer according to the manufacturer’s instruction. Then 2.5μl of the reaction mixture was subjected to PCR for amplification of iNOS and GAPDH using specifically designed primers for these genes and genes were co-amplified in each reaction. The primers were designed for iNOS (Forward: TCACGACACCCTTCACCACAA, Reverse: CCATCCTCCTGCCCACTTCCTC), and GAPDH (Forward: TGAGGTGACCGCATCTTCTTG, Reverse: TGGTAACCAGGCGTCCGATA), were analyzed respectively. The PCR reactions was carried out in a final volume of 10 μl containing 1x PCR buffer and Emerald AMP GT PCR Master mix 2x premix (Takara clonetech) and 0.4 μM of each primer. The template was denatured for 5min at 94°C, followed by amplification cycles at 94°C for 1min, 66.5°C (for iNOS, 61°C and 59°C for GAPDH) for 1min and 72°C for 1.20 min, and terminated with an additional extension step for 8 min at 72°C. The PCR products were visualized using 1.5% agarose gel electrophoresis with ethidium bromide staining. In negative control, template cDNA was replaced by DEPC water. Statistical analysis of the data was performed using two-way ANOVA and followed by student T-test. Difference between the values was considered significant *p<0.5, and highly significant**p< 0.05. Figure 1 represents the Color code: 1 Red: Superoxide free radicals (OD at 560 nm), 2 Blue: Total antioxidant (OD at 765 nm), 3 yellow: Hydroxyl free radicals (OD at 532 nm), for different estimations, n=5, *p values <0.05. A. heterophyllus showed the maximum high anti-oxidant capacity of 101%, superoxide radical scavenging capacity of 85% and the hydroxyl radical scavenging activity of 22%. S. cumini showed an anti-oxidant capacity of 92%, superoxide free radical scavenging capacity of 90% and hydroxyl radical scavenging activity of 43%. Z.mays silk extract showed anti-oxidant capacity of 96%, superoxide radical scavenging capacity of 85% and hydroxyl radical scavenging activity of 42%. Shilajit extract showed total anti-oxidant capacity of 97%, superoxide radical scavenging activity of 60% and hydroxyl radical scavenging activity of 43%. All the effects were tested at the lowest dose of the extracts (Table 2). Free radical scavenging efficiency of various plant extracts (n=5, p values <0.05*). The anti-glycation property and efficiency of natural extracts is represented in Figure 2. Our results demonstrate that the natural extracts had successfully restricted the glycation of hemoglobin. The exposure of hemoglobin to 2% glucose over a period of 24h and 48h increased the glycosylation of hemoglobin. The hemoglobin samples with 2% glucose when incubated with different concentration of the commercial drugs and natural extracts showed glycation inhibitory activity. The extracts of S. cumini and Shilajit showed better anti-glycation effects when compared to Insulin, glibenclamide, A. heterophyllus and Z.mays silk (n=5, **P < 0.05) (Figure 2). Glycation of hemoglobin: reduction in glycation of hemoglobin, when 2% of glucose was added to the blood samples in presence and absence of natural fruit extracts. (**P < 0.05). Among all the extracts used in the study, extracts of S. cumini and Shilajit were the most effective in decreasing glycation of hemoglobin. The anti-glycation effects of natural extracts were comparable to that of anti-diabetic drugs like human insulin and Glibenclamide; we observed that S. cumini and Shilajit extracts of 50 μg/mL showed higher activity than reference drugs i.e. Aminoguanidine, Insulin and Glibenclamide (Table 3). Glycation inhibition capacity of plants extract with different concentrations (represented as approximate percentages) at higher concentrations, extracts showed significant decrease in glycation of hemoglobin. After 35 days of study period, a significant decrease (n=5, **P < 0.05) was observed in the body weight (167.55 ± 3.96 g) of the STZ induced diabetic rats when compared with control group (234.44 ± 4.42 g). However, on glibenclamide (600 µg/kg.bw) administration to diabetic rats prevented this significant loss of body weight and helped in recovery of the body weights to near normal levels i.e. 226.00 ± 4.50 g (n=5, **P < 0.05). The administration of different natural extracts (A.heterophyllus, S.cumini, Shilajit and Z.mays silk) to experimental diabetic rats have shown similar efficiency in recovery of the body weights (220.11 ± 2.41; 221.25± 5.25; 218.55± 2.25; and 189.35 ± 4.25g), (n=5, **P < 0.05), but comparatively Z. mays silk extract showed less weight gain. (Table 4). Effect of natural extracts and glibenclamide on body weight in experimental groups. The effect of natural extracts and insulin on blood glucose levels in experimental diabetic rats were presented in Figure 3. In diabetic control rats, a significant rise (n=5, **P < 0.05) in blood glucose levels was observed i.e. more than 50%. The experimental diabetic rats, on administration with natural extract (200 mg/kg bw) significantly (n=5, **P < 0.05) reduced blood glucose levels by more than 50%, which was comparable to the effect of Glibenclamide in reducing the blood glucose levels (n=5, **P < 0.05). 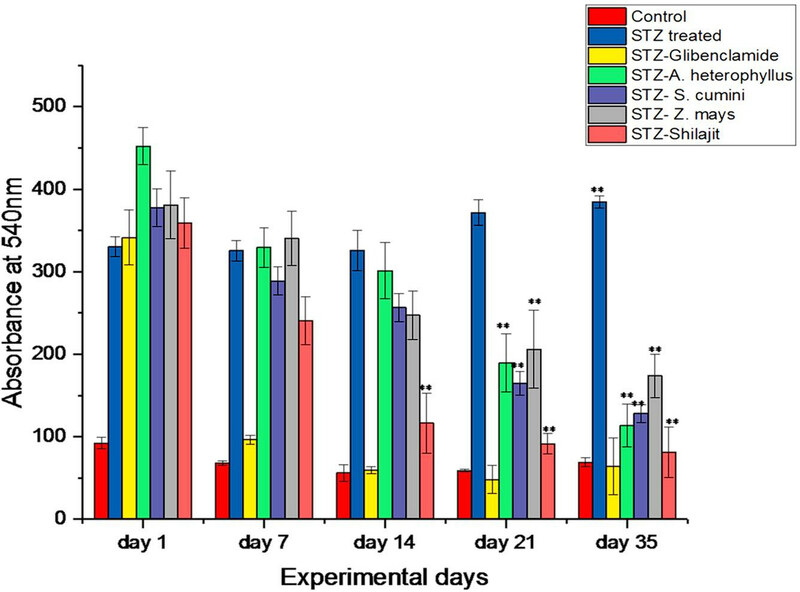 However, a significant reduction in blood glucose levels was observed in all the experimental rats on treatment with natural extracts, but it was observed that Z.mays silk extracts efficiency in controlling the blood glucose was very less when compared to the other extracts (Shilajit > A. heterophyllus > S.cumini ) and Glibenclamide. Findings from the above parameter, indicates anti-glycemic properties of all the natural extracts (Figure 3). Effect of natural extracts and glibenclamide on blood glucose levels in STZ induced diabetes model in rats (Data was analyzed by two-way ANOVA followed by Student T-test (n = 5); **P < 0.05 as compared to control animals and diabetes group at respective time points). 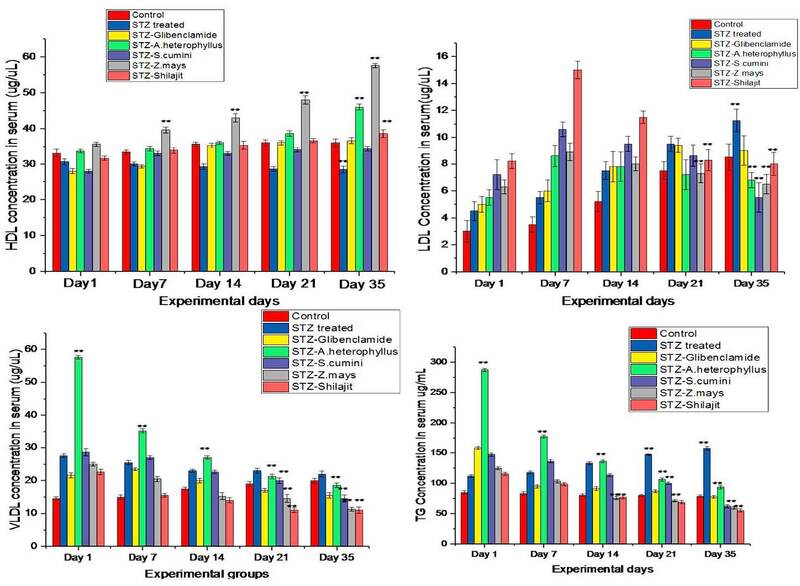 The effect of natural extracts and Glibenclamide on lipid profile in experimental diabetic rats were presented in Figure 4. In diabetic control rats, a significant rise (n=5, **P < 0.05) in lipid levels was observed with increased time duration i.e. more than 50%. In experimental diabetic rats on administration with natural extracts (200 mg/kg bw) significantly (n=5, **P < 0.05) reduced the levels of TGL, LDL, VLDL and increased levels of HDL, which was comparable to the effect of Glibenclamide in reducing the lipid levels (n=5, **P < 0.05). However, a significant reduction in lipid levels were observed in all the experimental rats treated with natural extracts, but on comparison, we found that S.cumini > Shilajit > A. heterophyllus > Z.mays silk. Findings from the above parameter, it is evident that the natural extracts do have anti-lipidemic properties and they are comparable to that of reference drugs (Figure 4). Hypolipidemic effect of natural extracts against STZ induced alterations. The histopathological findings: A) Control showed normal acinar cells in non-glandular pancreas (Black arrow) and there no signs of degeneration or necrosis noticed (red arrow). B) The STZ induced tissues showed mild fatty degeneration in the acinar cells of pancreas and fibrosis and hyperplasia was observed in ductular epithelial cells (red arrow) and periductular pancreas (black arrow). C) The tissue of Glibenclamide administered showed normal beta cells and acinar cells and mild hyperplasia was noticed in ductular epithelial cells (green arrow). D) The A. heterophyllus administration has reversed the degenerative effects induced by STZ, the acinar cells appeared normal and there were no signs of degeneration or necrosis (red arrow). The beta cells in islets of pancreas showed mild atrophy (black arrow) and periductular fibrosis (green arrow). E) Atrophy of beta cells in the islets of pancreas (black arrow) and mild degeneration noticed in the ductular region of pancreas (red arrow) was observed in S. cumini treated samples. F) The Z. mays silk treated was not able to counteract the STZ induced mild fatty degeneration in the acinar cells of pancreas and fibrosis and hyperplasia in ductular epithelial cells (red arrow) and periductular pancreas (black arrow). G) Shilajit treated samples showed normal acinar cells in non-glandular pancreas (Black arrow) and there were no signs of degeneration or necrosis noticed (red arrow) (Figure 5). Amelioration of STZ-induced histopathological alterations in pancreatic tissue exposure to natural extracts. Figure 6 shows the expression status of pro-oxidative and pro-inflammatory genes (iNOS) in pancreatic tissues of diabetic rats which received simultaneous treatment of natural extracts along with STZ. The molecular weights of iNOS and GAPDH are 250 bps and 104 bps respectively. Anti-oxidative and anti-inflammatory property of natural extract against STZ induced inflammation. Expression of the iNOS was compared to that of GAPDH gene (reference control). STZ-treated rats were fed simultaneously with natural extracts (200 mg/kg.bw) clearly showed anti-oxidative and anti-inflammatory effects and which was verified by iNOS gene expression in the pancreatic tissue. We observed that extracts of A. heterophyllus, S. cumini and Shilajit down regulated iNOS expression, whereas Z. mays silk extract did not show an effect on iNOS expression (Figure 6). Anti-oxidative, hypoglycemic and hypolipidemic efficiency of A.heterophyllus, Z .mays silk, S. cumini and Shilajit were demonstrated in the present study. The biological mechanisms by which natural products exerts their effects are not well understood. The composition of fiber, phenolics, flavonoid etc may govern the anti-diabetic effects independently or in synergy. Our results also reinforce the benefit of natural products as preventive and/or therapeutic agents in management of diabetes. Hence further research is needed to support and encourage use of natural products in managing diabetes. We want to thank Ms Swati, Ms Meghana for their help during the experimentation in Indigeneous Biotech pvt ltd.
• The present study reports the anti-oxidative, hypoglycemic and hypolipidemic efficiency of A.heterophyllus, Z .mays (Corn silk), S. cumini and Shilajit in both in vitro and in vivo studies. • The ethanolic extracts of A.heterophyllus, Z .mays (Corn silk), S. cumini and Shilajit has not shown any side effects. • The efficiency of these ethanolic extracts was evenly matched to the efficiency of commercially available anti-diabetic drugs, hence these extracts can be used as therapeutic agents in management of dia¬betes and these are cost effective as well. 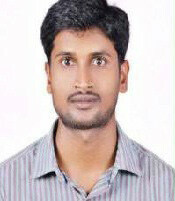 Mr Satish Kumar Vemuri, Research Scientist, SMART, Sunshine Hospitals, Secunderabad-500003, Telangana, India. Dr Rajkiran Reddy Banala, Research Scientist, SMART, Sunshine Hospitals, Secunderabad-500003, Telangana, India. Mr Kumar Katragunta, JRF, SMART, Sunshine Hospitals, Secunderabad-500003, Telangana, India. Ms Vijaya Madhuri, SRF, SMART, Sunshine Hospitals, Secunderabad-500003, Telangana, India. Ms Kiruthika Raju, Research Associate, SMART, Sunshine Hospitals, Secunderabad-500003, Telangana, India. Dr Gurava Reddy, Managing Director, SMART, Sunshine Hospitals, Secunderabad-500003, Telangana, India. Dr Subbaiah GPV, Director, SMART, Sunshine Hospitals, Secunderabad-500003, Telangana, India. Cite this article: Vemuri SK, Banala RR, Katragunata K, Madhuri V, Raju K, Annapareddy VGR, Goli PVS. Anti-diabetic and Anti-Inflammatory Efficiency of Indian Medicinal Plants against Streptozotocin Induced Diabetes in Male Wistar Rats. Free Radicals and Antioxidants. 2018;8(2):141-8.